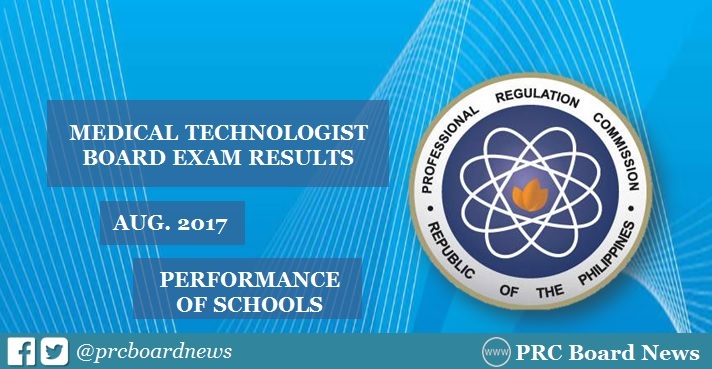 The Professional Regulation Commission (PRC) recognizes the top performing schools in the August 2017 Medtech board exam. The result was released on Thursday, August 31, 2017 or in three (3) working days after the exam. PRC hailed University of San Agustin, Cebu Doctors University, Holy Name University (Divine Word - Tagbilaran) and Colegio San Agustin - Bacolod City as the top performing schools - garnering 100% passing rate. PRC and Board of Medical Technology administered the Medtech board exam on August 26 and 27 in the cities of Manila, Baguio, Cebu, Davao, Iloilo, Legaspi, Lucena and Tuguegarao. PRC hailed Cagayan State University (CSU) - Andrews Campus, Cebu Doctors' University (CDU), Saint Louis University (SLU), University of Negros Occidental - Recoletos as the top performing schools in the August 2016 medtech board exam. The said schools got 100% passing rate. In February 2017 exams, SLU, Adventist University of the Philippines (AUP) and Far Eastern University (FEU) - Nicanor Reyes Medical Foundation topped the schools for having a perfect passing rate. Here's quick summary of performance of schools in the previous exams.